This week saw the company issue new guidelines for employees who might want to tempt fate and call 911. It’s a bureaucrat’s dream. The decision–making process includes observation, self–doubt, second–guessing, second opinions, re–checking the manual, calling corporate and then hoping the problem went away while the staff was negotiating with itself. Other incidents are a judgment call and require a corporate–choreographed decision–making process. 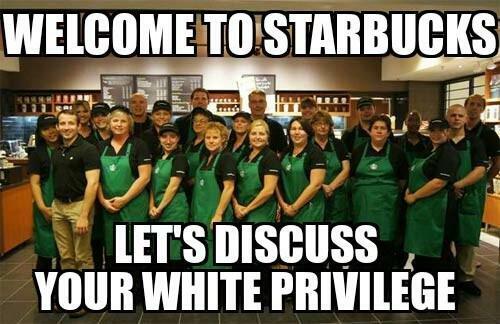 First the ‘partner,’ as Starbucks laughingly calls its employees, is to “assess” the ‘guest’s’ behavior. Is it culturally appropriate or is it cultural appropriation? It’s important for the partner to separate the behavior from the individual. The process resembles Evangelicals and homosexuality — hate the sin, while loving the sinner. Step three of the pre–emergency call journey is the partner “[considering] how any decision will affect the customer’s experience.” Will not cursing out the person who tripped over his shopping cart mean the guest suffers increased stress? Will he/she/zir experience heightened sexual tension if they’re prevented from groping an adjacent guest? And could the partner be judgmentally assuming “indecent exposure” when the guest was only trying to increase air circulation? Before this glacial minuet brings the partner within hailing distance of the disruptive guest, another partner must be asked to “observe and verify” the behavior. Only then is management to approach and introduce themselves and ask for the person’s name. And all this is before the May 29th shutdown of all Starbucks’ outlets for ‘Re–Education Day’ where highly paid trainers will hector the white partners in an attempt to stamp out “unconscious bias.” My last prediction is once that’s complete, all 175,000 Starbucks employees will be easy to spot: They’re the people not on the phone when all hell breaks loose. Under Obamahome, construction contractors would talk endlessly about how compassionate their employees are. Edgy companies would assert that dealing with an English–speaking crew makes rebuilding your home a breeze. But no company would be talking prices or making binding estimates. Under Obamahome, renters are also covered, but renters wouldn’t be required to pay a premium. And homeowners who had a loss, but weren’t covered by insurance — because they opted to make the final payment on their Sistine Chapel tattoo — can both buy a policy and file a claim during the same transaction. At premium–setting time, homeowners would discover Obamahome rates had to be set high enough cover their house and their prorated portion of the renter’s and the pre–existing damage claims. The Dallas Morning News reports Crystal Roberts was rushed to an emergency room after a car crash. The good news is she was home three hours later. The bad news is accompanying her was a bill for $11,037.35 for X–rays, CT scan, lab tests and ‘other’ services. Crystal was charged the ‘This Is Gonna Hurt’ rate because she lacked insurance. The ability to compare prices encourages competition, while concealing prices encourages price–fixing. The decision is a tentative step toward my simple, Constitutional, solution for increasing healthcare competition. First, require any hospital taking federal money to post turnkey prices for the 25 most common hospitalized surgical procedures; the 25 most common out–patient procedures and the 25 most common tests. All charges must match the best price offered insurance companies – the information the Texas hospital doesn’t want to share. Third, no exclusions for pre-existing conditions if the patient can prove continuous coverage for the prior six months. Otherwise, a six-month waiting period. Patients who don’t want to buy private insurance can participate in a federal high–risk pool. Curator of the Senate Mitch McConnell has decided to re-define his role in public life. McConnell is moving away from characterizing himself as a conservative legislative titan. According to an obsequious profile in The Weekly Standard (a Never–Trumper hotbed), McConnell has found his true calling. The curator believes the best use of his talents is to serve as the Human Resources Department for the federal judiciary. In his new role as head of HR McConnell contends that whatever happens to those losers in the House this November, the Senate must remain in his swampy hands. The Emperor of Inertia has come to the belated realization that voters were listening when he promised them electing a Republican–controlled Senate, House and White House would mean a rebirth of conservative legislation. The reality was different. Voters got premature ejaculations on election night and nothing has been conceived since. Like Union Civil War Gen. George McClellan, in his mind McConnell is always outnumbered and facing overwhelming odds. Mitch is convinced LBJ couldn’t have done a better job, but the voters aren’t. That means McConnell’s first task is political alchemy. He must turn stagnation into steak. Yet two of the three “accomplishments” are reactive at best. The only vaguely conservative legislation passed thru his initiative was the tax bill and taxes weren’t the driving issue during the 2016 campaign. None of the conservative legislation voters said they wanted has been passed. None of the leftist legislation conservatives want eliminated has been repealed. This is supposed to be good news? Up until this November Republicans had 100 percent of the power and did nothing. Losing half their legislative clout is supposed to raise our morale? Any perceptive conservative voter will ask the obvious question: What’s in it for me? 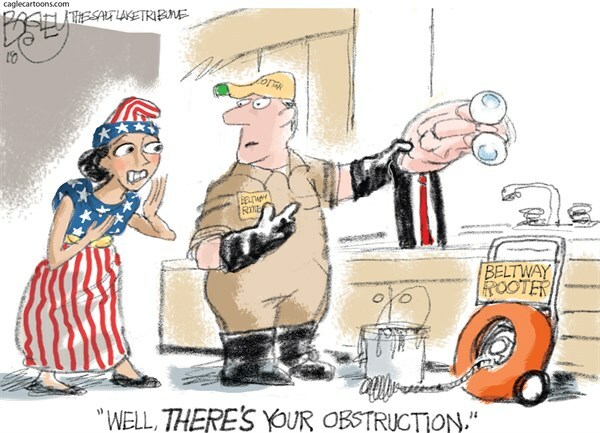 The truth is, nothing, but McConnell gets to keep his big office if the GOP wins. Hence McConnell’s makeover. He doesn’t want to move. The way to conceal his failure to repay the conservative base for its loyalty, is by completely changing voter expectations. Now instead of being Mr. Legislator, McConnell is telling voters he’s Mr. LinkedIn! The one–stop networking source for Republican lawyers looking for a soft landing in the judiciary. “If we hold the Senate,” McConnell explains, “we can continue to confirm nominations to lifetime appointments for a full four years and finish the job of transforming the American judiciary, which is my number–one goal.” You might say it’s one lifetime incumbent eager to recruit more lifetime federal employees, which he hopes won’t ‘grow in office’ once they land on the bench. Forget about resetting the dial on the family, immigration, religious freedom, federal spending or reducing the size of a bloated, wasteful federal government. Who has time for that when Mitch is conducting job interviews for circuit court? Even if you’re a conservative who buys into Senate–as–headhunter, there is this nagging question. Where do those judicial nominations that McConnell is so eager to ratify originate? Is there a ticker–tape deep in the bowels of the Supreme Court building that generates a candidate whenever an opening appears? Or does Mitch man a booth at legal job fairs where he lassos likely candidates? Well, no. Truthfully this matchmaker isn’t making any matches. Instead the nominations originate in a White House occupied by the dreaded President Donald Trump. I’m no cheerleader for Trump. His waffling on DACA, his short attention span and his embrace of the spend–a–palooza budget bill are infuriating. Still, without Trump in the White House there wouldn’t be any nominations to “transform the American judiciary.” Hillary would be president and she’d be sending the names of leftist politicians who think they look good in black. But we are 800 words deep in a 994–word puff piece before Trump’s name is even mentioned and then it’s in connection with impeachment! Mealy–mouthed, multi–chins like McConnell are the reason Trump won in the first place. Their continued failure to grasp that fact explains the trouble they face in November. What do Chipotle and the White House Correspondent’s Dinner have in Common? Easy. After the meal, everyone’s a little queasy. Except for Kathy Griffin. She’s furious. The White House Correspondents’ Dinner proved conclusively one picture is still worth a thousand words. The photo of Griffin holding a decapitated Trump head torpedoed her career. For months her reputation was in such bad shape that when Griffin appeared in the news it was like a sighting of Sasquatch or Harvey Weinstein. 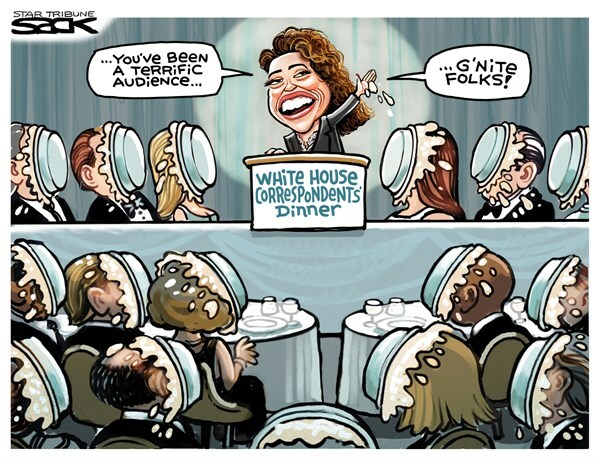 And irony of ironies, Kathy was at the correspondent’s dinner! She sat through Michelle Wolf’s crude and vulgar 2,400–word routine that savaged President Trump, the Trump family and his administration. Griffin defended Wolf in the face of widespread backlash, but I’m guessing when she got home, Kathy’s Trump head was in for a very rough time. It was the injustice of it all. After only one photo Griffin can’t book a lunchtime public appearance at Costco giving away pot stickers, while Michelle Wolf will enjoy an audience bump when her Netflix series begins later in May. If Kathy had waited until after the Correspondent’s Dinner to unveil her decapitated Trump on a #Resistance–filled world, she could have had a co–hosting gig with Joy Reid on MSLSD. But Griffin was too early. And, as any good comedian will tell you, timing is everything in comedy. Dinner organizers and Opposition Media attendees are still having trouble digesting Wolf’s routine. Even employees of media outlets regularly slow–roasted by Trump were taken aback by the sheer unfunny savagery of Wolf’s rant. It’s fortunate the one–year term of the WHCA president concludes shortly after the dinner, otherwise there might have been calls for resignations or an Adam Schiff investigation. When the dinner controversy popped up on Drudge, I assumed the unprofessional vulgarity–fest must have been part of an open mic portion of the program, and Wolf was the first exhibitionist to reach the podium. Instead, Wolf was recruited and paid to perform. Outgoing WHCA president Margaret Talev didn’t go so far as to apologize for the Wolf pack assault but she did her best to spin the disaster and shift the blame. She told CNN, “Comedy is meant to be provocative. My interest overwhelmingly was in unifying the country, and I understand that we may have fallen a little bit short on that goal.” Unless her idea of unification only extends from Antifa to the Deep State. Talev also assured America that she didn’t see or otherwise examine Wolf’s monologue prior to the event, as if ignorance was absolution. That’s not a dog–ate–my–homework excuse. It’s a dog–did–my–homework excuse. You could tell Talev was perplexed that anyone would hold her responsible for Wolf’s performance. This is probably due to leftists’ unfamiliarity with how capitalism functions. The person who signs the check, bears the responsibility — unless he has really good lawyers. Talev, a Bloomberg News reporter, simply employed the industry–standard OpMedia research practices when she booked Wolf. Verification was confined to discovering if Wolf hated Trump. With that established, it’s a given that what would come out of her mouth was sure to be enjoyed by the audience. And what a potty mouth it was! Unfortunately, as far as the left is concerned, today there is no room for peaceful coexistence with Trump and/or conservatives. This is why for Michelle Wolf poking fun wasn’t enough. She had to poke out some eyes. The WHCD program held no surprises for the Trump administration. They know the OpMedia hates them. The dinner simply revealed the truth to the rest of America. The Morning Consult did a nationwide survey in early April a few weeks before the dinner. One of the questions asked if the respondents considered the “national news” to be “liberal, conservative or centrist/non–partisan.” 36 percent of the pre–dinner sample either had no opinion or thought the media was centrist/non–partisan. Exactly. It revealed the ugly truth to the confused 36 percent who formerly gave the news media the benefit of the doubt. I’ve always wondered why the National Education Association (NEA) and the country club conservatives in the Republican House and Senate leadership aren’t allies, instead of enemies. Both organizations use the same tired talking points to defend inert members from the forces of accountability. When education reformers urge legislative bodies to adopt merit pay for teachers and thereby reward the best teachers with the most money, the NEA counters that experience is crucial and paying teachers according to seniority rewards that excellent system. Cong. Francis Rooney (R–Doomed) wants to remove Congress from that list. Rooney has formulated a brilliant method of implementing term limits that does not require an amendment to the Constitution. Rooney’s Thomas Jefferson Public Service Act would place no limits on how long a member could warm a seat in Congress — that requires an amendment — instead Rooney would reduce a member’s paycheck to $1 per year after they served six terms in the House or two terms in the Senate. My wife is skeptical. She believes after 12 years our ‘public servants’ have already made themselves millionaires, so the $173,999.00 pay cut won’t bother them. She is not alone. At the end of their term as chairman these members must surrender the gavel, without any reduction in salary or benefits. Many retiring chairmen look upon that gavel as the closest thing to Thor’s Hammer they will ever wield. Giving it up is such a personal Ragnarök that they retire from Congress rather than revert to being hammerless rank–and–file member regardless of their salary. I’m thinking not getting an envelope on payday would have the same effect. It’s one thing to talk about being a ‘public servant.’ Becoming one and working for free is something entirely different. Rooney is so serious he’s prepared to become very unpopular with his colleagues. In an interview with Fox News’ Bret Baier, Rooney correctly termed arguments against term limits legislation as “elitist paternalism.” He already has seven co–sponsors for his bill and he intends to put the heat on nominal term limits supporters. “There are 90 co–sponsors on term limit by [constitutional] amendment bills and there’s something called the ‘Term Limit Caucus.’ Let’s see what they want to do,” Rooney explained. This is where Rooney drops off Christmas card lists. 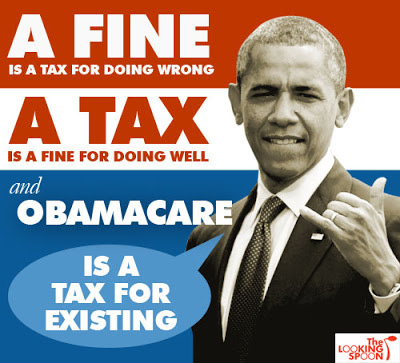 Co–sponsoring a term limits constitutional amendment is exactly like promising to repeal Obamacare. It’s showy and consequence–free. The chance of the amendment coming up for a vote is exactly the same as the chance of Donald Trump being named Man of the Year by La Raza. If the unthinkable happens — see Obamacare vote — and term limits comes to the floor, co–sponsors will cheerfully betray their voters just as Lisa Murkowski and Susan Collins did. Rooney’s bill will put these poseurs on the spot. 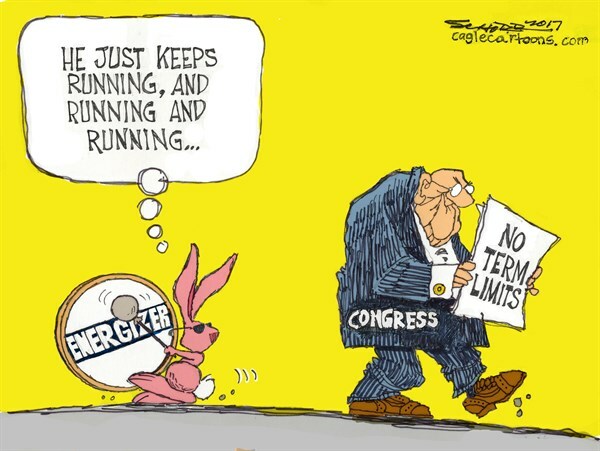 There are 26 members of the Term Limits Caucus, yet only two are co–sponsoring his bill. Rooney should have 31 co–sponsors and that’s before he goes after the amendment popinjays. True and the current system has given us McConnell as an example of what term limits would prevent. Rooney’s only misstep so far came in his announcement. He quoted former Oklahoma Senator Tom Coburn (R–Great American) who said Americans “are frustrated with the federal government.” True again. But Coburn is no longer in the Senate, because he imposed term limits on himself.